The Steenkampskraal Thorium Limited (STL) high temperature modular reactor (HTMR) is a Generation IV 100 MW helium-cooled power plant that features a thorium-based fuel cycle. The heat source is based on a fuel technology with intrinsic safety characteristics. This article discusses the benefits of a HTMR compared to other types of nuclear reactor. The power conversion is via a proven helical coil steam generator and the HTMR is a CO2-free nuclear thermal power source which can be used for power generation, process heat applications, water desalination and hydrogen production. The small size and modular construction results in a relatively low cost of construction and implementation. The HTMR has the broadest temperature range and is ideally suited to provide temperatures from 250 to 750°C. This is suitable to produce steam/heat/electricity or combinations thereof. Fig. 1: Temperatures required per application. 100 MW version is well suited to industrial processes. Since the HTMR is inherently safe, it enables placement close to processing plants to minimise energy losses. The HTMR has a large mass/low power density which results in slow response after events. This means that it requires no nuclear safety-related diesel generators and no nuclear safety-related active systems. Residual heat is removed by active and passive means, and this type of reactor has a strong negative temperature coefficient, adding to its safety features. It is small in size, extendable and, being a modular design, allows for the addition of extra modules, while the design facilities on-line fuelling. Small amounts of tritium are produced which makes inland operations possible. Spent fuel only needs simple dry cooling. The HTMR can be located above or below ground. High-level waste is in an acceptable form. No active cooling system is needed for spent fuel and no special facility is needed. There is only a low volume of medium and low level waste with blow-back filters used. The petrochemical industry is one of the largest consumers of primary energy in the form of diesel and jet fuel. Products include petrol and paraffin. Catalytic cracking and reforming requires temperatures of between 500 and 600°C. Gasification of coal with steam and oxygen to form syngas (CO + H2). The syngas is fed to the Fischer-Tropsch Process to obtain liquid hydrocarbon products (paraffins, methanol, etc.). Fig. 2: Operating temperatures for different types of nuclear reactor. High temperature and high pressure steam is injected into the bitumen to make it less viscous for pumping. Steam at around 300°C and 15 MPa is needed for this purpose. Heating oil shale releases kerogen which is used to produce liquid hydrocarbons. Ammonia production for nitrate fertilizers, at 400 to 600°C is needed. High temperature processing of phosphate rock (800°C for phosphate fertilisers). 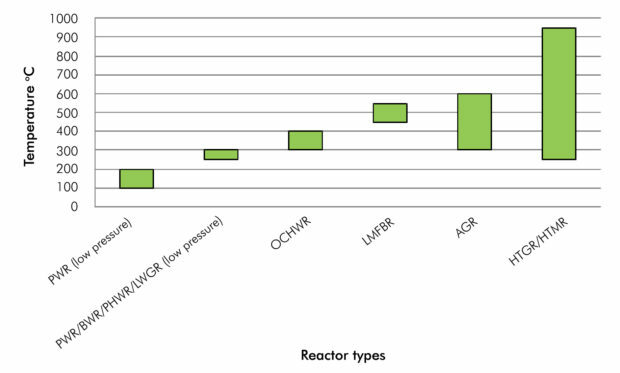 Table 1: Comparison of various nuclear reactor technologies. Low-density polyethylene and rubber vulcanization requires temperatures between 300 and 500°C. Hydrogen is needed for vast amounts of applications. The HTMR is perfectly suited to produce H2 as it produces extremely high temperatures. 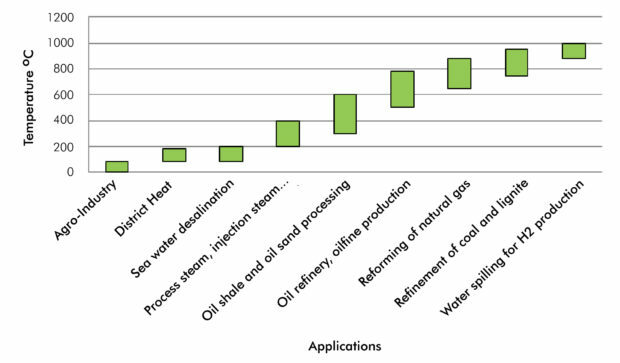 Hydrogen production can be done in a variety of ways: High temperature steam electrolysis (high operating temperature reduces electrical input (800°C required). Steam methane reforming (500 to 950°C). Thermochemical water splitting such as the hybrid sulfur process (HyS) (750 to 950°C required), a sulfur-iodine process (S-I) needs 850°C, and a copper-chlorine process (Cu-Cl) needs a temperature of 500°C. A small size reactor is perfectly suited to supply electrical power at the mines. Processing of non-conventional sources usually require high-energy inputs (heat and/or electricity). HTGRs can supply base load heat and/or electricity for such processing. Certain minerals (U and Th) are usually seen as side waste steams during commodity processing. HTGRs can be used to process minerals as well as wastes that can be used inside the reactor, creating a sustainable process. The HTGR’s inherent safety and transportability will allow construction close to processing plants that use advanced technologies to remove minerals that usually went to waste. Ninety-seven percent of the earth’s water is sea water. Fresh water at low cost is in increasingly short supply all over the world. Sea water contains around 3500 ppm of salt. The allowable salt concentration for human consumption is less than 500 ppm. Table 2: Electrical energy requirements for the mining industry. RO is a water purification technology that uses a semipermeable membrane to separate the solute (salt and minerals) from the solvent (water). MED consists of multiple stages. In the first stage the feed water is heated by steam. Some of the water evaporates, and this vapour flows into the tubes of the next stage, heating and evaporating more water. Each stage essentially reuses the energy from the previous stage. MSF is a water desalination process that distils sea water by flashing a portion of the water into steam in multiple stages of what are essentially counter current heat exchangers. Nuclear desalination is especially advantageous over fossil fuel processes as it is cost competitive and does not release greenhouse gases in the way the combustion of conventional fossil fuels do. The electricity/heat produced by the HTMR100 reactor can be used for reverse osmosis and desalination. Heat from the HTMR100 reactor can be used for a multi-effect distillation or multi-stage flash desalination plant. The HTMR100 reactor is versatile and can be used in a cogeneration application producing both electricity and fresh water and/or high temperature steam for other process applications. The post Thorium reactors and process heat applications appeared first on EE Publishers.